Count on Majors Home Improvement for replacement doors that provide the best in energy efficiency and beauty. We serve homeowners throughout the Greater Pensacola, Florida, area, and we’ll be pleased to work with you on your upcoming home renovation. 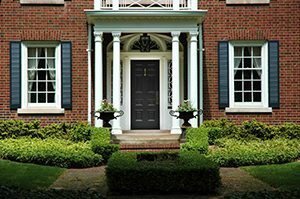 We install our Majors Select™ line of replacement doors that resemble the look of an oak or mahogany door, but have a solid polyurethane core. This core offers many times the insulation value of wood, and won’t fall prey to common wood issues, like rotting, cracking, and splitting. So, with Majors Home Improvement, you’ll have a door that looks beautiful and has very little maintenance requirements – that’s a win-win for anyone. Efficiency – We’ll complete your project in a timely manner, taking great care to be punctual and efficient when installing when installing a new door at your home. You don’t have to worry about dealing with weeks and weeks of a construction crew disrupting your day-to-day life. Constant communication – You will never be left in the dark about the status of your installation. We’ll provide you with updates via phone and email to ensure you always know what’s going on with your project. Fair pricing – Our quotes for our replacement doors are always honest and reasonable. We encourage our customers to seek out comparison quotes, as well. Cleanliness – Once we are finished replacing your entry door, we’ll clean up our jobsite, leaving nothing behind. There’s no reason to trust any other company for replacement doors in the Pensacola, FL, area. Contact Majors Home Improvement today to schedule a complimentary in-home consultation at your convenience.